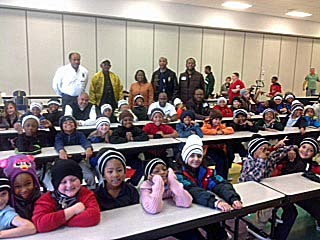 On Wednesday, October 29th, the brothers of Alpha Phi Alpha fraternity, Inc. Eta Tau Lambda chapter went to Barrett Elementary School and passed out over 300 hats and headbands to the student body. The students and staff were very appreciative of the brothers willingness to help prepare the students for the upcoming winter. The brothers arrived during lunch at 11:30 am distributing the hats to the children as they finished their meals and went outside for recess. Every student received a hat and headband selecting from an assortment of styles and colors. The brothers in attendance were Jamal Hamm, Daryl Brown, Tony Brown, Marcus Mariner, John Williams, Eufrancia Lash, Paul Stallings, Ricardo Myers, and David Jenkins.